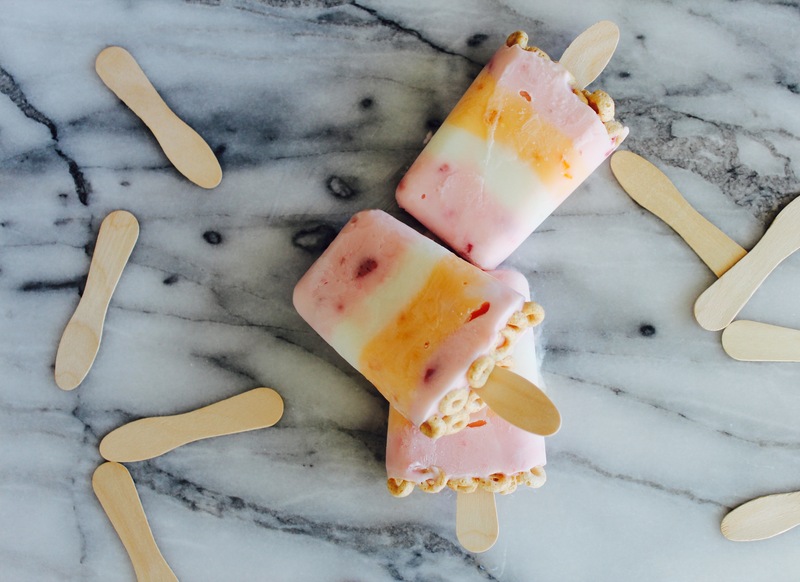 Happiness Project Recipe #65: Rainbow Cheerio Yogurt Pops! Heat. This Menopausal Mama does not LIKE heat. Alright, never mind. Like is too soft a word for my…distain of this (horrid) 90ish degree weather. Now HATE? HATE is much more accurate. So let’s start over. Heat. This Menopausal Mama HATES heat. Because in my life, with hot flashes and mood swings and weird (sad) skin, 90 degrees is actually much more like 100 degrees to me. Which is NO fun. NO. FUN. So you know what I do when I’m THIS grumpy and uncomfortable? I bake yummy things. Usually. Until now, when the physical aspect of baking doesn’t comply with my doctor’s (very strict) orders. Hence, new popsicles. All of which throw together 3 of my family’s favorite flavors: peach (for my Daughter), strawberry (for me) and vanilla (for my Husband). Oh, and cheerios. The staple of any family with toddlers pantry. At least now, since my Toddler is nearly 2 and a half years old, these cheerios are actually ON the popsicles instead of the floor. Or the couch. Or the dog’s head. And here’s the thing that I love about this recipe. Not only is this recipe so simple in ingredients and so easy in preparation that anyone can create them (kids too!) but I’m able to use the only yogurt that my stomach can handle correctly: Activia. Hallelujah! So if you too have a sensitive stomach with yogurts or milk, try Activia. It may change the entire way you see breakfast. Or dessert, perhaps. 6 cartons of your favorite Activia brand yogurt. 2 peach, 2 strawberry & 2 vanilla for this specific rainbow recipe. Firstly, organize all of the ingredients on your work surface. 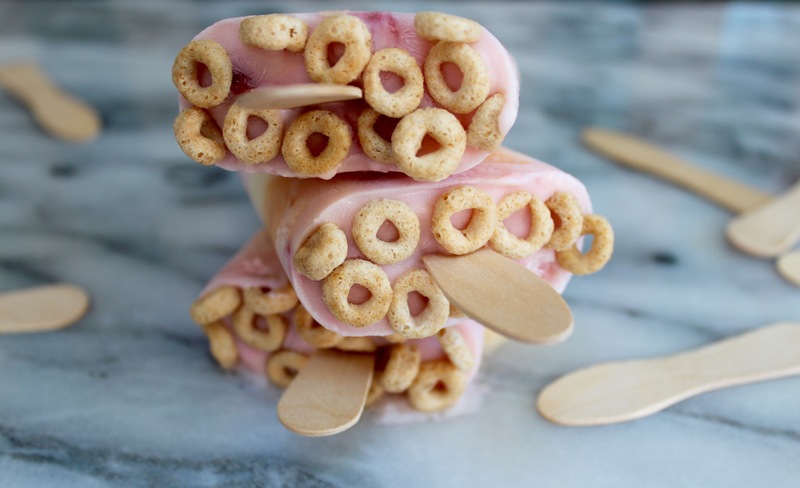 Yogurt, popsicle mold, wooden sticks and then cheerios. In each cavity of the popsicle mold, spoon in 1-1/2 to 2 tablespoons of the strawberry yogurt. Shake gently to smooth the surface. Place the mold in the back of the freezer for 10 minutes to harden up slightly. Continue this exact process with each of the remaining two yogurt flavors, remembering to freeze each layer in-between each addition. Once the 3rd yogurt layer has been chilling in the freezer for that last 10 minutes, remove and gently press in each of the popsicle sticks, until there’s a least 2 inches worth of stick visible above the surface, to use as the handle. Now, gently push in as many cheerios as will fit around each handle. Freeze for a good 30 minutes to an hour so that the entire popsicle is fully frozen. And eat. Or nibble on. Or let your kiddo run around outside with it, waving it gleefully in the air. Until you’re hands are sticky and your toddler is grinning from ear to ear! Let’s beat this heat! One rainbow popsicle at a time! « Happiness Project #64: Santa Fe Mock Up Salad! This sounds super yummy and perfect for the crazy heat wave we’re in right now! These sound so easy and delicious! I need to try them. So will they help with the hot flashes when I eat one or do I need to rub it in my body LOL. Someone that hasn’t experienced hot flashes won’t understand. But it is miserable, it’s like an internal heater running inside your body )-: Thanks for sharing your yummy recipe. This is perfect for my toddler. Thanks for the idea! Two of the few things my oldest will eat are cereal, yogurt, and ice cream! This seems like a fun way to combine those three!